I love this dough – it’s rich, smooth and wonderfully buttery. This is a lot of work to make, and unless you have arms of steel I would recommend using a stand mixer for this recipe. These snails are lovely. 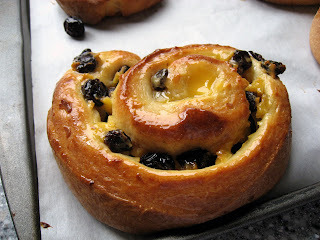 The rich dough is wound around a dense custard and sprinkled with rum soaked sultanas (raisins). Ingredients: Basic Brioche Dough (use half the dough for this recipe. Make sure to make the whole batch though – as yeast dough is really hard to make in different quantities). 1. Put the yeast, water and milk in the bowl of a stand mixer and, using a wooden spoon, stir until the yeast is dissolved. 2. Add the flour and salt, and fit the mixer with a dough hook. 3. Put a tea towel over the mixer (to prevent the flour from covering everything when you mix it). 4. Turn the mixer on and off for a few short pulses, then remove the towel. 5. Increase the mixer speed to medium-low and mix for 1 - 2mins, just until the flour is moistened. 6. Scrape the sides and bottom of the bowl with a rubber spatula, set the mixer to low and add the eggs, followed by the sugar. 7. Increase the speed to medium and beat for around 3 min, until the dough makes a ball. 8. Reduce the speed to low and add the butter in 2 Tbs sized chunks, beating until each piece is almost incorporated before adding the next piece. The dough will soft, and more like a batter then a conventional dough at this stage. 9. Increase the speed to medium-high and continue to beat until the dough pulls away from the side of the bowl (around 10 min). 10. Transfer the dough to a clean bowl, and cover with plastic wrap. Leave to rise in a warm place for 30-40min. 11. Pick the dough up from the sides, and let it fall back down into the bowl with a slap. 12. Cover with plastic wrap and place in the fridge. Every 30min for the next 2 hours, slap the dough down in the bowl. 13. Leave the dough in the fridge overnight. 1.In a saucepan add the custard powder and a little of the milk. Stir to blend in making sure there are no lumps. 2. Add the rest of the milk and add the cream and 100g sugar. Stir well to incorporate. 3. Put the heat of the stove top onto medium-high and with a whisk stir the custard mixture until it becomes thick (the whisk should leave visible gouges in the custard). 4. Take the saucepan off the stovetop and add one piece of butter at a time, making sure to combine the butter well before adding another piece. 5. Leave the custard mixture to cool down to room temp (periodically whisk it to make sure it doesn’t form a skin). 6. In a small saucepan soak the raisins in hot water for 4 min. 7. Drain them, and then place them back in the saucepan. Warm them over low heat until they become quite hot (stir constantly). 8. When they are hot, take them off the stove and pour over the rum. 9. Stand back and ignite the rum. Wait until the flames die out and then cover the raisins with a lid. 10. Mix the sugar and cinnamon together. 1. Line a two baking sheets with parchment paper. 2.Using half the chilled dough, roll it out into a rectangle on a floured bench top (12” X 16”). 3. Spread half the custard onto the dough leaving 1 inch spare around the edges. 4. Sprinkle on the cinnamon and sugar. 5. Sprinkle on the raisins. 6. Roll the dough from one of the smallest edges towards the other. Roll as tightly as you can. 7. Here you can wrap the tightly rolled snails in plastic wrap and freeze for later use (to use frozen, defrost overnight in the fridge then take them out and let them rise for around 1.5 hours and bake as directed below). 8. With a sharp knife trim the dough at the ends. Cut the log into 1 inch pieces. 9. Place on the lined baking sheets making sure to leave room around each snail. 10. Lightly cover the snails with wax paper and set the baking sheets in a warm place to rise for 1.5 hours. 11. Heat the oven to 375F. 12. Bake for 25 min (they are done when they are puffed, and a light brown). Dough and raisins taken from the stunning Dorie Greenspans's book "Baking from my home to yours" pp. 56-7, 48-50. 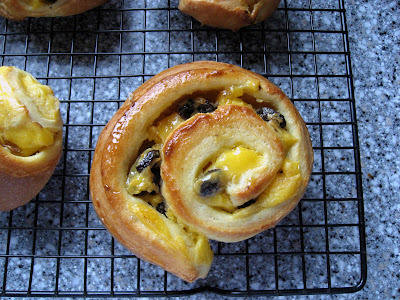 I've made the brioche dough before but have yet to make the raisin snails, yours look awesome!